As connectivity becomes a key part of the mission, Uplogix enables IT staff to deliver higher uptime and manage distributed campuses with less windshield time. Uplogix brings a number of benefits to network management in education. 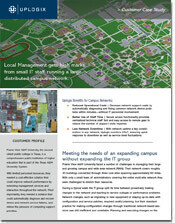 Often small teams are responsible for campus networks that span one location, or multiple campuses across town or across a state. Reduced Operational Costs | Decrease network support costs by automatically diagnosing and fixing common network device problems within minutes—without IT personnel involvement. Better Use of Staff Time | Secure out-of-band access functionality provides centralized technical staff fast and easy access to remote gear to reduce the number of support visits required. response to downtime as well as service level fluctuations. CASE STUDY | Uplogix allows a small team to manage a large WAN covering over 30 building across three core sites spanning 60 miles at a fraction of the cost of adding additional staff members to monitor the network 24/7. I can’t always leave our main campus and drive to a remote site when we have a problem. With Uplogix on duty, now I don’t have to. At a fraction of the cost of adding new people, Uplogix drives immediate increase in device monitoring and an extended reach across the network. Uplogix’ automatic diagnosis and recovery procedures reduces the number of service failures and the time it takes to restore service when an interruption does occur. WAN Traffic Failover (WTF) can actually make downtime a thing of the past by passing primary traffic over the out-of-band link. Uplogix provides complete control and visibility over remote locations, whether that is one campus or all the schools in a district. Network administrators spend less time resolving service outages and have more time for proactive efforts to ensure the network is ready for the ever-increasing demands of education. 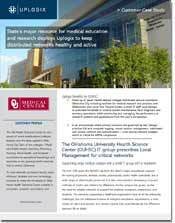 CASE STUDY | Seven health-related colleges distributed around downtown Oklahoma City use Uplogix to contribute to HIPPA compliance by automating routine system maintenance and monitoring with logging and access controls – even during network outages.